will go to the lucky winner. 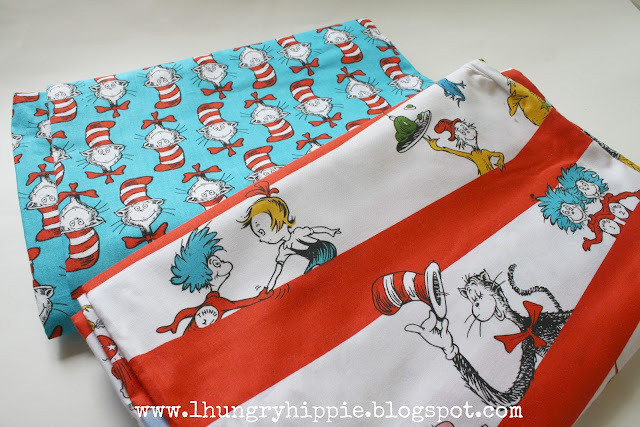 Two yards total, that's enough to make something super special for the Dr Seuss fan in your family. Answer the obligatory question, of course. (Leave a comment with your "return reply" on. I try to respond to them all. You can choose one of these, or both. Sometimes I'm in the mood for thinking, and sometimes....not. ...and the best song on it? Q2: If you knew you could not fail, or be denied, what would you do right now? Now if you can, go do a good deed for someone, anyone...they probably need it. May 25 5pm Pacific Time. I will ship to USA, UK, and Euro zone Europe. I suppose I can ship to the Kiwis and Roos of the world as well. Go on. If you want to follow me on this humble blog I'd be honored. I'll enter your number twice for the drawing. A little bribery never hurts, right? If you have taken the time to read this you are a rarity indeed. Oh it would have to be the ABBA Gold! (Ekk showing age here! lol) and as for one song, sorry cant do that, I'd have to say all of them :o) I am also a loyal follower. What would I do right now? Start a small farm based school for those kids that just don't fit well with public school, my son included. My favorite album is Casualties of Retail by Enter the Haggis, and my favorite song is Down with the ship. Um, ultimate song album...No Strings Attached by *NSYNC, yes I was a boy band groupie. lol Fav song on it: It's Gonna Be Me. 2nd question is a tough one...so much I would want to do for friends and family that it is hard to pick just one thing. Q2. I would start my handmade cards business. It's Purple Rain from Purple Rain. I would win the lottery and pay off my debt and my parent's debt. Sorry I pressed publish before I was done- My favorite is Evanescence's first album. I'm sure I would love some other classic rock albums more but this is the first to come to mind. The song would be Bring Me to Life. Thanks so much for the giveaway! "And then there were three" by Genesis...."Follow you, Follow me" is my favorite song on it. It's my husband and my "song". If I knew I could not fail or be denied right now I would quit my job and become and stay at home mom & sew quilts for a living. No question. I would quit my job and stay home and make a living out of sewing! Hard choice - my favorites hold so many memories of me and my husband and our kiddos, so Sting - Mercury Falling "Brought to My Senses", Hootie & the Blowfish - "Hold my Hand", Rush - Test for Echo "Carve away the stone", and Yes - the Ladder "If Only You Knew". I would open a couple of cute stores in a row. A tea shop, a crafty shop, and a homeschool teacher shop. If I knew I could not fail I would probably try to run a marathon. I have always wanted to do that but I have never had the dedication to train for it! Very fun! Hmmmm....if I couldn't fail, SING! I love to sing, but not so good at it! ;) And musicals....well, we love them....Sound of Music, My Fair Lady, Seven Brides...you name it! Can't get enough! Thanks so much for this great giveaway, we LOVE Suess! I love Decade and the song Ohio. I would open a quilt store, that also has rug hooking and crafting, we need one in our local area. my favourite album is introducing by foxy shazam. it's a great rock album with a touch of heavy metal inspiration. their later stuff is more accessible, but introducing will always be my favourite! And "no fail"? I'd complete a triathalon (no need to win or anything, I just want to survive to the end). There is no choice the album would have to be Ed Sheeran, an amazing album, just a beautiful sound. U2 Joshua Tree. Best album ever! And I would open a bakery. What a great giveaway, and fun questions. Thanks! If I knew I wouldn't fail, I'd make my living with my Etsy shop! The White Album by The Beatles favorite track is I Will. String cheese incident- one step closer. I would become a nurse midwife and deliver some babies! Oh man, I love waaaaay too much music to answer the first question. So I'll have to say: if I could not fail, I'd make an offer on house in the town we're moving to, and start packing in earnest. I would help my autistic son succeed in life. ok, obviously i'm biased... but my husband used to be in a band called losing anna. their self titled album brings back memories of three years of absolute fun and a lot of blood sweat and tears and growing up done. http://www.amazon.com/Losing-Anna/dp/B0019BBFIA/ref=sr_1_5?ie=UTF8&qid=1337617057&sr=8-5 they were losing anna, and my favorite song (right now) is runaway. Question 1-- My husband and I were just talking about this the other day :) It depends on the mood I am in, I think. I like a band called Bleach (they have since broken up) because their music tends to put me in a good mood! Hmmm, if I knew I could not fail I would pick the winning lottery numbers to the next Jackpot ;) I promise to do lots and lots of donating with the money! Thanks for the chance to win, love all Dr Seuss fabric! I'm not good at choosing just one favorite ANYTHING but I'll give the album thing a shot and say Sultans of Swing - The Very Best of Dire Straits. I especially like the song Romeo and Juliet. If I could not pass out or break my ankle, I would totally go out and run 10 miles right now. I'm a follower. Queen A Night at the Opera and the song Bohemian Rhapsody. Queen was the best! What would I do? I sew for the children's hospital and I would make something special for every single child and bring a smile to their face! Live #2 by Robert Earl Keen "The Road Goes on Forever..."
Ohio by Over the Rhine. Too many songs I love to have a favorite song. My favorite band is O.A.R., and I love any of thier live albums. My favorite song is "Untitled". If I knew you could not fail, or be denied, I would audition for a lead role in a movie. I would start my own business... something with a creative angle, involving my art in some way. If I knew I could not fail... I would buy a ranch in Colorado or Texas. Sounds silly, I know, but it's what I wish I could do. I love the new Adele CD. I could listen to it over and over. Can't pick a favorite though. I love Aida, with my favorite song probably being "Not Me." Favorite album?! You're not making this easy. Let's go for something foreign. I love the French singer Camille's album, Le Sac de Filles. They Might Be Giants, Dial-a-Song. Hard to pick a favorite song on it, but I'll say New York City. Q2: If you knew you could not fail, or be denied, what would you do right now - Enter the lotto and win it all! Journey's Time3. The best song on it is Separate Ways. Favorite Album of all time... well since I only buy greatest hits albums I would say I have 3, since I listen to them most Journey Greatest Hits, Def Lepard The Vault, ABBA Gold. If I couldn't fail, I would learn to ski. If I could do anything and not be denied, I would ask someone with a nice house and lots of land in the mountains to sell me their house/land for $1. Strange...maybe...but that's the truth. I would play in the lottery !!! Poe's Haunted is an amazing album, but it's a concept album so the whole is way bigger than the sum it's parts. I think my favorite song is "5 1/2 minute hallway" on there. I would love to create a pattern from scratch and sew myself something adorable!! if I knew I wouldn't fail that is! If I knew I could not fail or be denied, I'd be a stay-at-home mom and would sew/quilt/cross-stitch as much as possible! Ernie Toppin, Metamorphosis album, O Man of God. oohhhh such a tough question! Guess I can only answer as to how I feel right now, it might be different tomorrow! right now I'd say the I am Sam soundtrack, it's Beatles covers but by amazing artists and I just love it! Best song, Blackbird or You've Got to Hide Your Love Away or Lucy In the Sky... really all of it! If I knew I could not fail, Id ask my husband for another baby....ssssh dont tell anyone! My favorite album is Deguello by ZZ Top! Love the fabric giveaway! awesome! thank you! If I couldn't fail or be denied, I'd write & publish a middle grades reader book. Favorite album of all time is Metallica's Black Album, best song is Unforgiven, what can I say, I had an angry youth LOL. Thanks. I would ask my DH for a baby (hey, might as well make it several more! )...and this time he would say yes. 1. Favorite album Beatles Let It Be..Let It Be. MGMT's album Oracular Spectacular. In the song "Kids" my favorite line is "control yourself, take only what you need from it". I would love to get a good hug and kiss from my husband that's watching the Champion's League final, AGAIN, because Chelsea won and he's still savoring it. If I knew I wouldn't fail I would quit my job and start a business with my hubby. If I knew I couldn't fail I would start a diet!! Maybe I shouldn't have had 3 pieces of my birthday cake today!!! Apply for a job that I have only dreamed of as a child, but never thought I would be able to actually achieve. Led Zeppelin 2 - Ramble on!! Thanks for your generosity! We love Dr Seuss here. My #1 album of all time is probably the ABBA gold collection. The best song is Take a Chance on me! I would design some fabric! If I couldn't fail or be denied, that's what I'd do! Thanks for the giveaway! I woulf snach up my family and friends and go to the beach! If I knew I couldn't fail and was able, I would leave the US and find a teaching job in Europe. That's where my heart truly lies! Right now, I love anything by Adele. I'd have to say ABBA gold...love to clean to it. My favorite album of all time is The Joshua Tree by U2. If I could do anything and not fail, I'd retire! Oh my, I couldn't pick my favourite album! I LIVE and BREATHE music, so that it's really hard. How about my favourite band at the moment? That's Black Stone Cherry! If I could do anything and not fail/be denied, I would totally ask the guy I like out. As it is, I'm too wimpy. If I couldn't fail/be denied, I'd travel the world with my family in tow. Great questions! Great giveaway too, thank you! Wow what awesome questions. I think if I knew I couldn't fail I would start a business right now. It just seems that crafty businesses are not easy to keep profitable.. but I would love to share! If I could not fail I would FMQ I have tried many times and crashed and burned. If I knew I couldn't fail I would open my own vet clinic. My favorite album is the soundtrack to the movie Once. I love every single song on there! If I could not fail, I'd become a fabric designer, of course! I've been a follower for a while- thank you! Alan Jackson Precious Memories - 'Tis So Sweet to Trust in Jesus. I would have a designer create a quilting space just for me with all new machines, tables, shelves. If I know I wouldn't fail, I would go back to school and get my masters. If I couldn't fail, I would open up my own daycare center! Favorite music is the Grease Soundtrack and the best song is "You"re the One That I want"
I couldn't possibly pick a favourite album but I can tell you that if I could do anything I wanted I'd be outta my 8-5 office job and homeschooling adopted children on a farm somewhere. I'd open a bookstore. Then I could sit in there with my books and do whatever I wanted! :> Thanks for the chance to win! If I could do anything I would open a healing center using several modalities. To be able to heal the spirits not just the body. Could use some now. Springsteen's Born in the USA...love that album. Definitely Point of Know Return by Kansas and my favorite song is Dust In The Wind. Q2: If I knew I could not fail, or be denied, I would love to open a coffee shop and bakery. I would dive in the ocean and swim to Bora Bora. My current favorite album is Adele 21 and my favorite song is Rolling in the Deep. I love lots of music so I could have made many more choices. i love rolling in the deep! i would love to swim! Wow, if I couldn't fail or be denied... I'd get rid of 80% of the stuff in my basement and make it a nice cool living room for the summer months. Alas, with a hoarder husband I may never get my dream. I love these fabrics... my daughter has been bugging me for something made of Dr. Seuss fabric for a very, very long time. Two hard questions! I would build a deck on the back of our house by myself so we could enjoy this lovely weather. Hmm...Sticky Fingers (Rolling Stones), with Wild Horses as the best song. As for what I would do if I couldn't fail, cut my own hair I suppose. While I have tons of music that I like, if I were on a desert island I would have to have my John Mellencamp's "Uh-Huh." Abbey Road, the Beetles of course! Once there was a way, to get back home, pretty darling do not cry. I will sing a lullaby. If I knew I could not fail, I would open a crafting store. Beatles white album. Rocky raccoon is a fun song. The Eagles Unplugged. My favorite song is Best of My Love. Thanks for a generous giveaway!!! My favorite album is the best of Los Panchos. I love all of their songs, not just one but Cuatro Vidas is a good place to start. Oh it really depends on the mood. I love Unforgettable by Nat King Cole. It's so timeless and fun to sing along with. Hmm, that's a hard one. I'd have to say Steve Miller Band and The Joker as my favourite. CLASSIC! Thanks for the giveaway! If I could not fail, I would go fix CYFD. It really needs the help. I first thought..."go to sleep" or "lose 30 lbs" but that is probably because i am in bed....and need to go to sleep! Well, one of my favorite albums of all time is Michael Jackson's Thriller. I LOVE Beat It :) If I knew I couldn't fail, I'd buy a lottery ticket! Thanks for the giveaway! I love the music from Evita. I think the best song was Don't Cry for Me Argentina. I would play the lottery so I could win millions of dollars & get to do more things without being denied! Fleetwood Mac, Rumours.,..best song, Don't Stop. Best album of all time? Saturday Night Fever Soundtrack. Best track - Staylin' Alive. Everytime I hear that song I feel like getting up and strutting! Hmmm, all time fav musical album....I think the one that has never left my CD case (am I dating myself here?) is By the Way by the Red Hot Chili Peppers. The opening strings "By the Way" never fail to lower my blood pressure. Great giveaway! Thank you. I like Scotty McCreary's Clear As Day album and I like Water Tower Town on it. Thanks for the giveaway! My favourite album would have to be One by Swedish House Mafia haha. Favourite song is Miami to Ibiza. Derp! If I knew I could not fail or be denied, I'd start up my own fabric store here in Australia and live a happy fabric-filled existence for at least the foreseeable future! Also, I now follow your blog on Bloglovin. Ahhh!! Too much thinking! My favorite music album is Tranantlanticism by Death Cab For Cutie and my favorite song is Lack of Color. Favourite musical, Phantom of the Opera'. Fav song 'All I ask of you'. Gorgeous, just like these cool prints. If I could do anything without failing or being denied, I would publish my novels. Dr Seuss is awesome, what a great giveaway! I love the album Save Me, San Francisco. My favorite song is You Already Know. If I could do anything without failing or being denied, I would be a film director. I love Dr. Seuss, and know it would make a great project for one of my younger siblings! Thanks for the awesome giveaway! Elton John, Your Song, my favourite all time song and I saw him perform it a Brighton a zillion years ago! Great giveaway thanks. My favorite "album" is more current, The Lord of the Rings Soundtrack. My favorite song is Into the West sung by Annie Lennox. Makes me cry every time. Thanks for the chance to win! #2 I would make a dress! Miossec, "Baiser", song "La Fidélité". If I could not be denied....? I'd go back to my ex. Album: The Lion and the Cobra, song: Troy, by Sinéad O'Connor. Thanks for a great giveaway, my 7 year old loves Dr. Seuss and learnt to read by rereading Green Eggs and Ham until even his younger sister knew the words by heart! if i could do anything, i'd leave my day job and the fabric laboratory would be come a reality rather than a pipe dream! My fav musical album is Grease and the song would be You're The One That I Want! I would travel the world photographing the places I love or want to love, the architecture that is inspiring and the crafts and trades that are quickly disappearing. John Mayer's Continuum is my favorite right now and Slow Dancing in a Burning Room is my favorite song on it. I love Westlife- Coast to Coast. The fave song is Coast to Coast. I love the album for Wicked: The Musical. Best song on it is Gravity. If I knew I could not fail, I would open an etsy shop to make some extra spending money for fabric. If I knew it wouldn't fail I'd open a sewing cafe type shop with two friends - we talk about it all the time but it is just too risky in the current economic climate. 1. I think American Idiot by Green Day is one of the best, cohesive albums out there. I see why the made it into a musical - it's fantastic. 2. I'd resign from my job. Favorite album- Pink Floyd- Division Bell. Song- What do you want from me? I did choose one thing, I became a nurse. It was my dream, and I'm living it. It's very satisfying when you can come home from work and know that you helped to keep someone alive all night. It goes hand in hand with prayer. HMM I think that Johnathan Livingston Seagull has to be one of my favourite albums of all time.